This purchase is due to Carl’s contribution to the New Shooter Ammo Fund, and has been marked and set aside for that specific purpose. The same amount of .223 ammo ((Prvi Partizan M193)) would cost a bit more than seven times as much, and would be considerably bulkier and heavier. Although prices have risen, .22 is still cheap, small, compact, and lightweight. It’s also a heck of a lot of fun. Didn’t that used to be like 11.95 a box? Been a long time since I’ve purchased .22 – boy has it gone up in price. Probably. I seem to recall it being about that price a while back. I remember when Winchester Dynapoints were $15/500 too. That nearly $30 a box. What the hell? I found 3 bricks of winchester and paid $45 for them. I sold 2 of them because I’m the ammo lookout for out little group. I buy it and then they buy it off me. Shawn: Price was $25.50/500rds, not counting shipping and the NRA round-up. Had I not had to worry about shipping, I would have gotten a fourth brick. 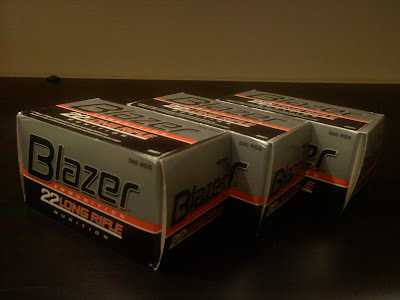 While I’m sure I could find cheaper stuff if I looked really hard, Blazer runs really well in my 10/22, is pretty reliable (certainly more so than the huge bulk packs one can buy), and reasonable enough. Did you get the Winchester bulk-packs? I’m in California on vacation visiting family, and I refuse to buy ammo here and provide tax revenue to California. Hey just wanted to say thanks for the tutorial on the 10/22 magazine assembly, I had everything done except for how many turns to tension the spring, your post fixed that! Willy: My pleasure. Glad to be of help.